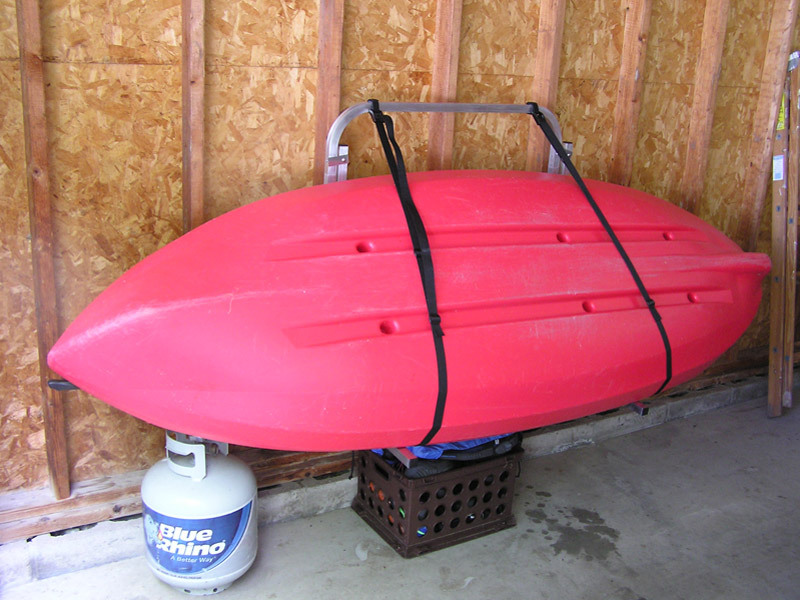 The Wall Mount Conversion Kit is a great accessory to the dock mounted kayak rack. When your kayaking season is over, hang these brackets to the wall of your garage, shed, or cottage. Store the dock mount brackets inside your kayak! Keep your kayak safe and off the floor. – Free Shipping within the lower 48 states. Canadian shipping rates available. “The DockSider” Kayak | Paddleboard Wall Mount Rack – Conversion Kit is designed for the user that needs to store their Kayak | Paddleboard on a wall (inside or outside). Given you have already purchased a Dockside Kayak | Paddleboard | SUP Dock Rack from DockCraft Industries LLC and you need to store your kayak or board for the winter, the Wall Mount Conversion Kit is your best solution for your off season Kayak Storage or Paddleboard Storage needs. Just mount these wall brackets; 32 inches apart on wall studs or a sturdy wall. 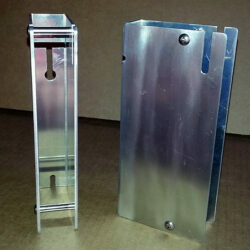 Remove your Dock Side Rack from your dock and mount your “DockSider Dock Mounted Rack” in the slots of these brackets. It’s that easy! Store your Kayak Dock Rack or Paddleboard | SUP Storage Rack Dock Mounts inside your vessel; or on the Wall Mount brackets themselves. 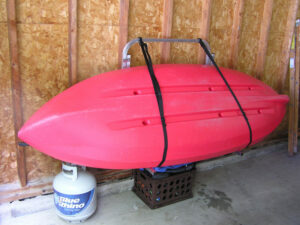 With this Wall Mount Rack – Conversion Kit, your Kayak or Paddleboard sits off the floor and conveniently on your wall. High enough to store items (propane tanks, crates, etc.) underneath; maximizing the storage space you have! For the Dockside Dock Rack, mount the unit as is. For the Waterside Dock Rack, just reverse the Cradle and Pivot arm assembly to the opposite sides of the handle and then mount. Just remove these assemblies by depressing the snap buttons. When you purchase the Wall Mount Conversion Kit you get all that’s necessary for installation (Aluminum Wall Mount brackets and the required mounting hardware). What size Kayak will fit the Wall Mount? We have tested numerous models of Kayaks in our Storage Rack. Kayak maximum weight of 100lbs has been determined . I am concerned about scratching my kayak on the cement floor when using the Wall Mount Kit. Is there a problem with this? To prevent any scratching it is recommended that you lay a piece of rug or indoor – outdoor carpeting on the floor where your kayak will slide. This is readily available at your nearest home improvement store.